Optodisc Stands For Consistent Quality and Stability. Vinpower introduced its new line of Optodisc recordable media a year ago and it has been an amazingly successful venture. The main reason is the media has simply and consistently performed. When customers use the Optodisc media in their duplicators and/or with their printers, the media burns and prints successfully and does so time and time again. When they use the burned Optodisc media in their players, it plays consistently. Basically, the media performs the way itâ€™s supposed to and each batch works exactly the same as the previous batch and the batch before that. Vinpower has been adamant about maintaining both the media quality and the consistency across all manufactured lots. So if youâ€™re happy with the performance, youâ€™ll continue to be happy as the media will continue to work in the same manner every time you buy it. Optodisc is not a brand itself, but a manufactured media that is the basis for a number of popular brands currently on the market. To find out if your media is Optodisc manufactured, look for the Optodisc MID or contact a Vinpower representative to learn which brands are made from Optodisc. 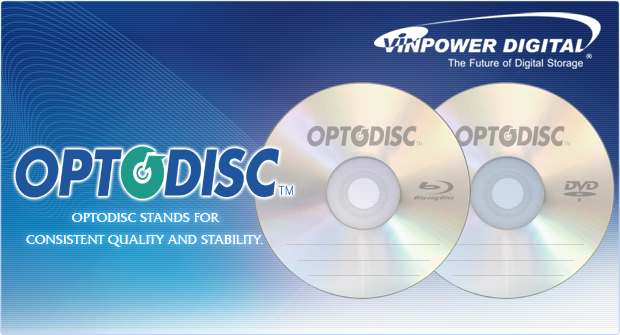 If you havenâ€™t had the opportunity to try Optodisc media for yourself, contact a Vinpower representative today to see how much Optodisc will save you. 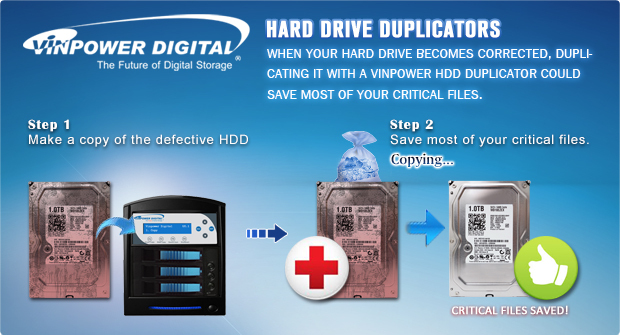 When your Hard Drive becomes corrupted, duplicating it with a Vinpower HDD duplicator could save most of your critical files. As weâ€™ve learned, computer hard drives (HDDâ€™s) can be very volatile and with the about of viruses and other problems lurking around, your HDD could be susceptible to corruption and you lose access to all of your files. When you use a Vinpower Digital HDD duplicator, you can make a copy of the defective HDD onto another clean HDD and save all of the uncorrupted files, including website bookmarks, pictures, videos, presentations, etc. without reproducing the problem that incapacitated the original HDD. Often, the key files on the corrupted HDD are safe, you just canâ€™t access them, but when you copy the content to a working HDD through a Vinpower HDD Duplicator, then you can access those files again and not have to pay a fortune for a HDD forensic engineer to recover your content. There may still be some files that are too badly corrupted or infected to salvage, but a vast majority would most likely still be safe and accessible. So, donâ€™t pay a fortune to recover your important files, or give up on a damaged HDD and toss it without recovering many of your important files, use the Vinpower Digital HDD Duplicator to recover your files. The HDD Duplicator works on standard 3.5â€ HDD, slim 2.5â€ HDD, and the 2.5â€ SSD. For more details about this or any other Vinpower products, please visit our website at www.vinpowerdigital.com or speak with an official Vinpower representative.